Well, we take a scalpel and…just kidding! At North Houston Laser Tattoo Removal, we get rid of your ink using good old fashioned science. When you come in for your consultation, we’ll assess your tattoo and provide you with an estimate on how many sessions you will likely need and what the approximate cost will be for the full treatment (see our previous blog posts on the cost and timing of laser tattoo removal). On your first appointment, you’ll meet our Q-Switched laser, which is the main tool we use to get rid of your tattoo. We’ll give you special glasses to protect your eyes and then apply the laser to your tattoo. The laser works by producing pulses of light energy. The light passes through your skin, hits the ink below and breaks up or “shatters” the ink. This doesn’t happen all at once. Clients may need to come in for multiple visits. As the ink is shattered, your body will naturally absorb it and flush it out of your system. After each treatment, we ask that you keep the treated area covered for three days and regularly apply an antibiotic. We also strongly suggest that you avoid pools or baths, though showers are okay. 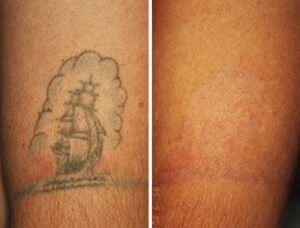 You should know that there are several different tattoo removal lasers on the market. Some of the lower-quality brands aren’t able to fully break own difficult tattoos. They don’t apply as much light energy and can’t reach the deep ink. Lucky for you that at North Houston Laser Removal, we use the best laser possible, which means that when you sign on with us, your tattoo is as good as gone. If you’re worried about the pain of the procedure or the cost, be sure to read our previous blog posts on those topics. If you still have questions about how our treatment works, don’t hesitate to give us a call at (281) 440-GONE. One of our friendly technicians would be happy to explain more or to help you schedule an initial consultation.